Nevertheless, as soon as I reached my weight loss goal on Thursday, I knew exactly how I was going to celebrate. I dug out Nikki email’s announcing the champion of the cupcake competition, and I went in search of my victory prize at Sugar Daze! Sugar Daze is a quaint, unassuming little place tucked away very inconspicuously in the 9th arrondissement not far from Pigalle. When we arrived, I was struck by its simplicity. The storefront with its sixties-inspired logo gave way to a small interior dominated by a heavy wood dining table and chairs. The walls were stark white, the one facing the entry decorated with album covers (some, but not all, American classics), the one to the right featuring a huge mirror to add the illusion of space. And to the left, our hostess stood behind a display case like a salesperson in a Paris jewelry store. 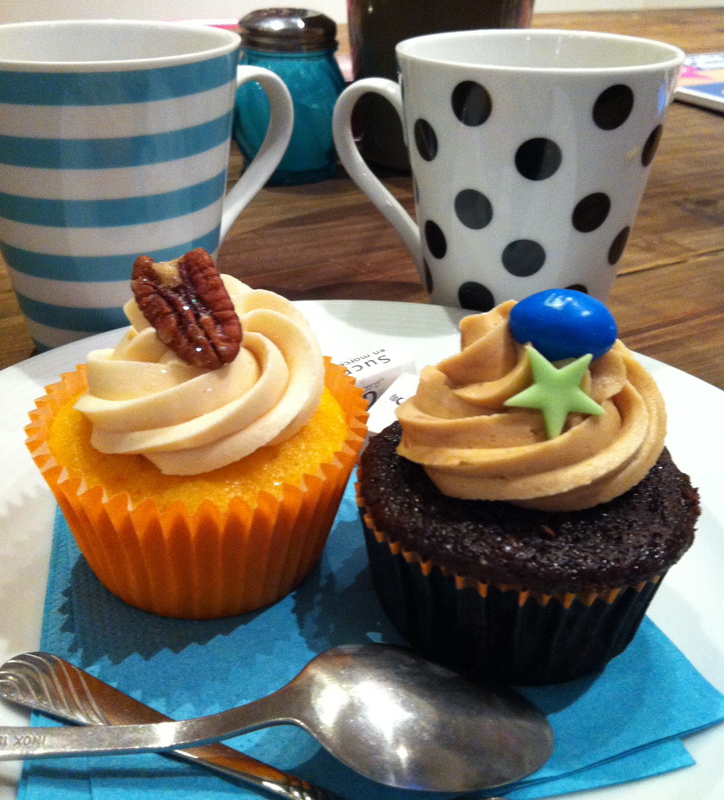 In fact, the cupcakes were so good, we couldn’t stop with just one each; we had to split a third. But just like our initial choices, this one wasn’t at all easy to make. With flavors (and names) as intriguing as “Orange Mignon” (lavender cake with orange buttercream), “Wake Me Up Before You Go Go” (cinnamon cake with mocha buttercream), “Empire State of Mind” (apple-spice cake with maple-cinnamon cream cheese icing), “California Dreaming” (lemon cake with crushed pistachio buttercream), and “Sweet Thai O’ Mine” (coconut cake with key lime buttercream), how are you supposed to choose just one?! (You can take a look at the complete menu here and see how difficult our decision was!) After some deliberation and not just a little restraint, we finally decided on a “Rapture” (vanilla cake with salted butter caramel icing and a chocolate-covered malted milk ball), and it was scrumptious! 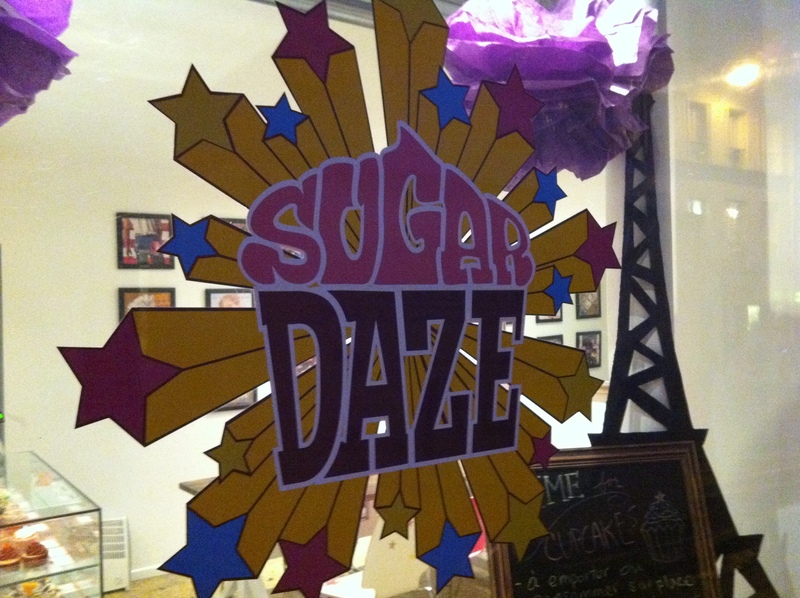 I spoke with both our hostess, Christina, and the owner, Cat Beurnier, about the story behind Sugar Daze. Cat came to France some 9 years ago and started her cupcake business in 2008. In the beginning, it was a catering-only affair: parties, weddings, you name it. But in June of this year, Cat opened the doors of her little cupcake boutique, and now anyone can just stop by and sample her beautiful, delicious, and truly unique cupcake creations. Michel and I had arrived at 5:45 on a Friday evening, so we couldn’t stay and chat with Cat for very long … or lounge around eating more cupcakes. (Maybe that’s a good thing, as my willpower had completely crumbled with the first bit of that Jumpin’ Jack Flash.) Cat didn’t send us away empty-handed, though; she offered us two more for the road — on the house — and we chose a “Dirty Vegas” (chocolate cake with chocolate icing) and another Jumpin’ Jack Flash. That night at dinner, my mother-in-law raved over the Jumpin’ Jack Flash — more proof that I was completely wrong about French people and pumpkins. Sugar Daze might seem a bit expensive: 3,80€ a pop. Then again, this is Paris, and Cat’s creations are truly decadent little works of art. The only problem is that they’re so good, you could easily bust your budget in a single afternoon hanging out at Sugar Daze! 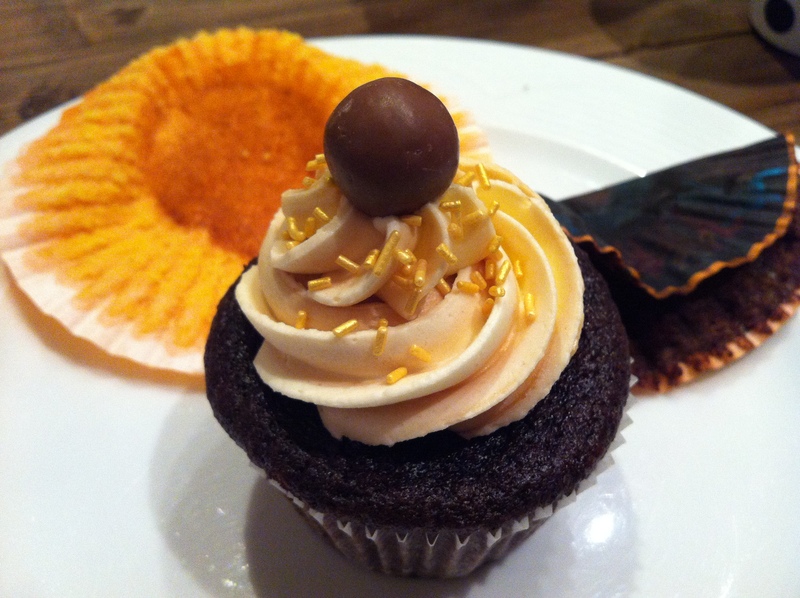 So, if you’re jonesin’ for an American cupcake in Paris, look no further, my friends. The Perpetual Passenger and je parle américain agree: Go straight to Sugar Daze and see what Cat has cooked up for you! You will not be disappointed! Sugar Daze is located at 20 rue Henry Monnier, 75009 Paris, not far from Pigalle on the 2 and 12 lines or St-Georges on the 12. Hi there! It was great to have met you too! I’ll have to update the post with your name. By the way, I’ll probably see you again on Friday if you’re there because I’m bringing a friend who’s excited about trying these magnificent creations! À bientôt!